Geography is a subject that is often overlooked in school. Students get bits and pieces, but many graduate without the ability to locate major landmarks or cities easily on a map. The study of geography can lead to a deeper understanding of our world and goes far beyond simply being able to point out Rome or Mount Everest quickly. What’s more, you can find geography lessons hidden in all sorts of other subject matters—from the arts to literature to science to math. It’s all happening somewhere, right? The good news is that teaching your children about geography is as simple as making it part of the conversation and the environment at home. 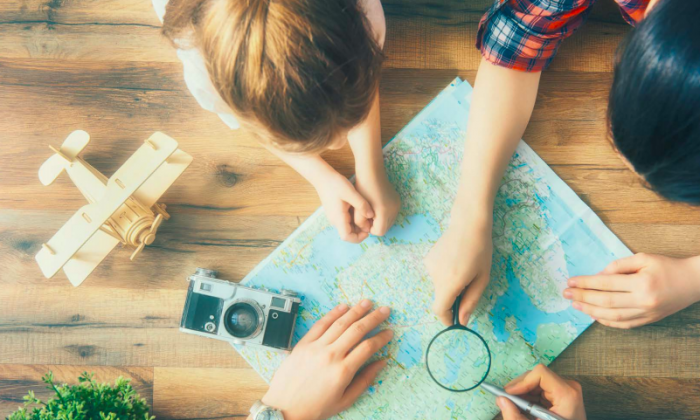 With just a little focus on the subject matter, your children will come to love geography and develop a natural appreciation for and curiosity about the world around them. The easiest way to dramatically increase your children’s knowledge of geography is simply to hang maps at home. Hang a number of them in prominent places. You can find beautiful ones that enhance your decor, but make sure they are legible and accurate. You will find that their curious little minds can’t help but look at the map often. Over time, they’ll take it all in. With these resources around, you’ll find your children will start to have lots of questions about all kinds of places. And when they read or hear about a place, they’ll run to the map to find out where it is! Kids can quickly “piece” together their geography knowledge by playing with puzzles. There are a number of wooden puzzles for kids illustrating the map of the United States or the world. There are a plethora of documentaries, not simply focused on geography (though Smithsonian Channel’s “Aerial America” is outstanding), but about anything that can be related back to geography. Whenever possible, travel to different places with your children. Such practical education can’t hold a candle to what they manage to pick up in school. When you’re planning your trips, involve your children. Consult a map—a local map if you’re traveling an hour away and a world map if you’re traveling internationally. Trace the route you’ll take on the map, the places you’ll pass or fly over, the landmarks you’ll visit, the bodies of water, the mountain ranges you’ll see, and the major cities you’ll pass through. Give Siri a break and hand a physical map to the kids in the back seat and let them tell you how to get to your destination. Very young children may not be ready for such a task, but you can start small. Perhaps you need to reach the store around the corner and you have a map of your town you can use with them. Older kids with some map reading experience can take the reins on full-fledged road trips. Hands-on learning sticks and it’s fun. Just pack an extra dose of patience. When reading a new story, find out where the author is from and locate the story’s setting on your map. When learning about any famous historical figure, find out where they were from and have the children point to it on the map. When hearing about a current event in the news, head to the map to check out where it is happening. History, art, music, scientific discoveries all happen somewhere by people who were born somewhere. Ask where. Train your children to ask where. As they grow, the dots will keep on connecting. The world our children face today is tremendously complex and fast-paced, far more so than the world past generations faced in their early years. Should Children Learn Civics and Economics? Most curricula and schools have failed to instill these time-tested values into the rising generation.